We manufacture an extensive line of cultured marble products, including sinks, vanity tops, paneling, shelving, windowsills, and custom-cast products designed for both beauty and durability. 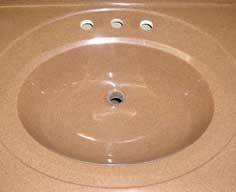 We offer a large assortment of standard and custom-blended colors and can match all major plumbing appliance manufacturers’ factory colors. 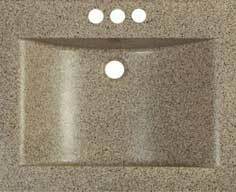 Cultured granite is available in modular as well as custom configurations. Custom units are available in a variety of lengths and sizes from 24 to 120 inch lengths and 19, 22, or 25 inch depths. 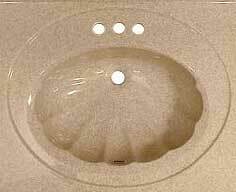 Multiple bowl units are available, limited only by the length of the unit. Special Configurations, such as banjo, angular, and “L” shaped tops, with custom depths, allow customers to express individuality and imagination. 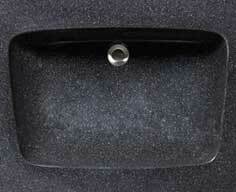 A variety of configurations can be achieved by using specially designed mold templates. Options and accessories available include sidesplashes, window sills, fireplace surrounds, wall panels, tub surrounds, and soap dishes. 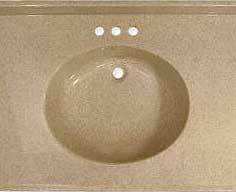 Solid color bowls are available in Newport or Rectangular bowl styles. Customers can expect dimensional variance of +/- ¼” on all cultured marble products.